She’s a published author, but Stephanie Oakes is a librarian first. It’s her passion to “create a love of reading and learning for every student,” said Oakes, who has worked at the Libby Center for six years. There won’t be a seventh. On Thursday, every librarian in Spokane Public Schools received notice that their jobs will be eliminated next year. Those with less experience will probably be laid off this summer, as the district copes with a projected $31 million deficit next year. Oakes is lucky, though she doesn’t feel that way. She’s been placed in the “involuntary transfer pool,” meaning that she might be teaching in a classroom this fall. Others aren’t shocked at all. Across the nation, school libraries are under siege. 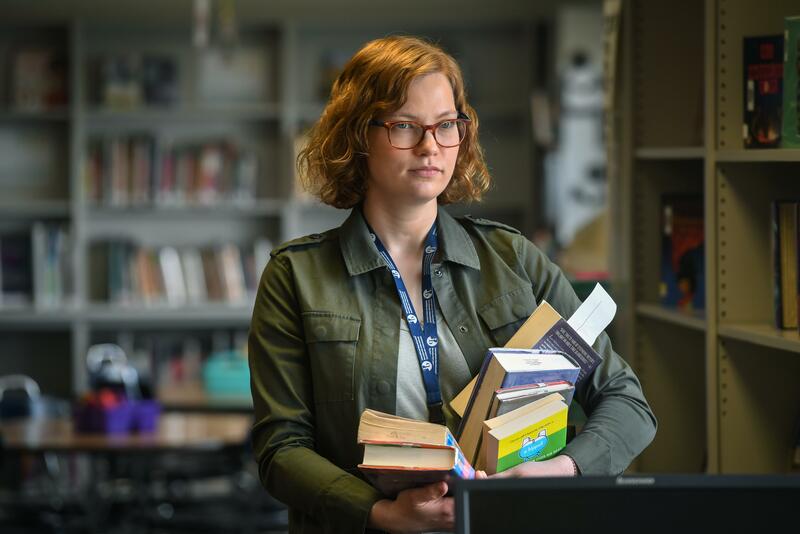 In Seattle, the school district is considering moving all librarians to part-time status. In Chicago, the number of full-time librarians and media specialists dropped from 450 to less than 150 during a four-year period ending in 2018. Last year, the National Center for Education Statistics reported that from 2009 to 2016, more than 9,000 full-time equivalent school library positions were eliminated. That’s about 15 percent of all positions nationwide. That trend has reached Spokane Public Schools. Elementary school teachers will bring their students into the libraries for designated periods. “What that means for librarians is that they will be moving back into the classroom,” district spokesman Brian Coddington said. “Students will still have access to library books and materials the same way they do now,” said Coddington, who added that it’s unclear how much money the district will save by eliminating library positions. “The students’ experience in the library will revolve around their classroom teacher,” Coddington said, adding that library hours will not change. Yet those teachers aren’t trained librarians, said Oakes, who describes herself as a kid who didn’t fit in until she discovered the world of books. “I didn’t have a place where I belonged,” Oakes said. Oakes grew up in Spokane, went on to earn a master’s in fine arts at Eastern Washington University and has published two novels. Her first work, “The Sacred Lies of Minnow Bly,” was a Morris Award finalist. The book is now a web television series, but Oakes posted Thursday night on Facebook that “I am prouder of my library than almost anything else I’ve achieved in my life, and I will be devastated to leave it. That includes ordering the right books and offering specialized help. Other duties may include instruction of students in library science; lesson planning and professional planning with teachers; and training faculty and students in the use of technology. Research shows a correlation between high-quality library programs and student achievement. Data from 34 statewide studies suggests that students earn better standardized test scores in schools that have strong library programs. In a Pennsylvania study, the difference in reading and writing scores was even greater for minorities. It found that while 1.6% fewer students tested at the Below Basic level in reading when they had full-time librarians than those who did not, the difference was greater for African American students (5.5%), Latino students (5.2%), and students with disabilities (4.6%). Published: April 12, 2019, 6:30 p.m. Updated: April 12, 2019, 8:36 p.m.